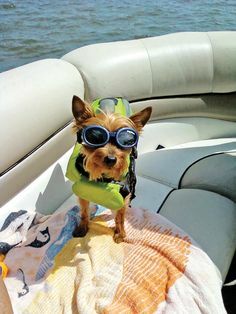 First thing is to invest in a life jacket for your furry friend. Your dog may be a strong swimmer but depending on conditions if there is a case your dog may go overboard, she may face some difficulty. Also life jackets are excellent in a situation such as this because you can use it to pull your dog safely out of the water. Most are built with a handle on the back for this purpose. You must always have a stocked first-aid kit on your boat at all times, but be sure to add a few extra items for your boating pal. Experts suggest bringing antibiotic ointment for minor scrapes, gloves, and bandages for dogs are great to have as most are made specifically for your fur-covered friends. Dogs have to check out every new space and smell every new corner they come across. The boat is no different. Make sure to visit the boat with your dog before going on your trip, maybe even a few different times. Once she is well equated with the boat and the surroundings, she will be more comfortable on your trip. On the first few times traveling the waters with your dog pal, you’ll want to keep the trips short so she can adjust to the movements. Dogs can get seasick just like humans, sometimes this can be severe. If seasickness is derailing your plans for a trip with your buddy, ask your veterinarian about medications to help. Water. Water. Water. Your pets need to be hydrated if they are spending prolonged time in the sun! Just as important as water, shade is essential to keeping your pet hydrated. They will not heat up as quickly if they have a nice spot to chill under and hide away from the suns harsh rays. It’s important to remember that your dog has skin under all of her fur, and if you are spending some time in the sun, it is likely that they will develop a sunburn. Experts suggest something light weight, and definitely unscented. Some surfaces of a boat can quickly become very hot out in the sun. Be aware of these areas that tend to heat up fast, cover them up to protect your dog’s foot pads. Your dog may need steps to climb aboard the boat from the water. Especially with a medium sized or larger sized dog, you will want her to have steps to help her get on board. You may not be able to lift your wet dog above the side of the boat without injuring her. There are hazardous areas on a boat and your dog is likely to want to explore the whole thing. Make sure you keep an eye out for these areas and your dog’s interest in what they should not mingle with. Block hazardous areas off. Beware of slippery spots. Knowing your dog’s location at all times will prevent injuries. A day on the water with your best pal is awesome when done correctly. Use these tips and always consult your vet about other helpful things you may need to know before bringing your dog out on the boat.